Show and Tell from Bay Nature website. Disturbing signs singly, but together -- brings home that many, many things have been converging. And of course the photo essay was made before the worst of the drought began to manifest. 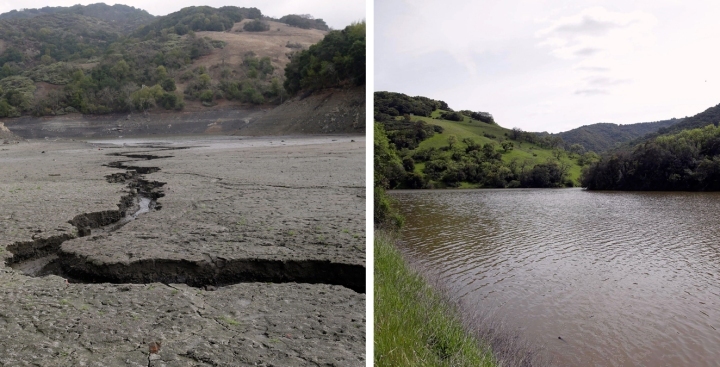 This combo of two photos shows (left photo) the cracked-dry bed of the Almaden Reservoir on Friday, Feb. 7, 2014, in San Jose, Calif., and (right photo) the same Almaden Reservoir full of water on Monday, March 14, 2016. Four straight days of rain have replenished several key reservoirs in drought-stricken California. Boom and bust weather pattern. "... most of [California's] infrastructure was designed and built during the 20th century, when the climate was unusually wet compared to previous centuries. That hasn't set water management on the right course to deal with long periods of dryness in the future." Ingram and other paleoclimatologists have correlated several historic megadroughts with a shift in the surface temperature of the Pacific Ocean that occurs every 20 to 30 years—something called the Pacific Decadal Oscillation (PDO). The PDO is similar to an El Nino event except it lasts for decades—as its name implies—whereas an El Nino event lasts 6 to 18 months. Cool phases of the PDO result in less precipitation because cooler sea temperatures bump the jet stream north, which in turn pushes off storms that would otherwise provide rain and snow to California. Ingram says entire lakes dried up in California following a cool phase of the PDO several thousand years ago. Warm phases have been linked to numerous storms along the California coast. That said, scientists caution against pinning the current drought on the PDO alone. Certainly ocean temperatures, wind, and the weather pattern in the Pacific have contributed to the drought, says Nate Mantua, of NOAA's National Marine Fisheries Service in Santa Cruz, California, where the PDO pattern was first discovered and named. "But it's more nuanced than saying the PDO did this." After all, as its name suggests, the PDO is decades in the making. Need to find the water from somewhere, fast. "For the past century, water use has been increasing at more than twice the rate of the population increase"
Nestlé’s Chairman, Peter Brabeck has added considerable influence to the issue of strategic water supplies. As the head of one of the world’s biggest food companies, he has stated quite bluntly that the problem of water scarcity is a far more urgent crisis than climate change. In his view, much greater attention needs to be devoted to this predicament. Society has been treating water as a free and infinite raw material and as governments implement tougher rules for its use, the cost of water will continually increase around the world. By 2030, demand for freshwater is now expected to exceed global supply by around 40%, affecting both populations and economies, according to the 2030 Water Resources Group. For the past century, water use has been increasing at more than twice the rate of the population increase, as highlighted by the Food and Agriculture Organization (FAO). With a current world population of 7.6 billion and forecasts suggesting a further 40% rise in the population to 9.6 – 10 billion by 2050, water usage will need to triple to a minimum of 10 trillion cubic meters (105.94 trillion cubic feet) a year in order to meet the increased future demand. Nowadays, the agricultural sector already accounts for 70% of the total global water use. According to the FAO, there will be a need for a 70% expansion in global food production up to the mid-century point, meaning that there will be a greatstress on water to be able produce enough food for all world consumers. With water being an essential resource for different industries such as agriculture, energy, mining and high-tech; it will continue to impact companies around the world. In the US, between 2010 and 2014, the average water price had increased by 33%, widely affecting different companies. At the same time, in the three years up to 2014, companies such as Nestlé, Coca-Cola, Ford, and Rio Tinto have spent more than $84 billion in improving the way they conserve, manage and obtain water consistent with data from the Global Water Intelligence and the Financial Times. "Sao Paulo state, Sabesp’s controlling shareholder, is going through its worst drought in at least four decades"
Sao Paulo risks having its biggest reservoir run out of drinking water within 100 days unless it starts rationing, Brazilian federal prosecutors warned. Water utility Sabesp and Sao Paulo Governor Geraldo Alckmin have 10 days to come up with measures to deal with the crisis, according to a statement on the prosecutors’ website. Both may be sued to force them to start rationing if they don’t take appropriate action, it said. The utility disagreed with the recommendation, it said in an e-mailed statement to Bloomberg News. “That measure would penalize customers and may have the opposite effect,” it said. Efforts by Sabesp and the population have already reduced demand equivalent to a rationing regime that would allow water for 36 hours, followed by a cut in supply for 72 hours, the company said.
" A group of water oligarchs in California have engineered a disastrous deregulation and privatization scheme. And they've pulled in hundreds of millions of taxpayer dollars without causing much public outrage. The amount of power and control they wield over California's most precious resource, water, should shock and frighten us -- and it would, if more people were aware of it. But here is the scary thing: They are plotting to gain an even larger share of California's increasingly-scarce, over-tapped water supply, which will surely lead to shortages, higher prices and untold destruction to California's environment." "The leader of these recent water privatization efforts in California is a Beverly Hills billionaire named Stewart Resnick. Stewart and his wife, Lynda Resnick, own Roll International Corporation, a private umbrella company that controls the flowers-by-wire company Teleflora, Fiji Water, Pom Wonderful, pesticide manufacturer Suterra and Paramount Agribusiness, the largest farming company in America and the largest pistachio and almond producer in the world. Roll Corp. was ranked #246 on Forbes' list of America's largest private companies in 2008 and had an estimated revenue of $1.98 billion in 2007. "They are a limousine liberal power couple. Hyperactive in politics, business and philanthropy, the two raise huge amounts of cash for the Democratic party, donate to the arts, support education and hobnob with influential progressives like Arianna Huffington and the anti-global warming activist and producer of An Inconvenient Truth, Laurie David. Stewart Resnick gave over $350,000 to the Gray Davis campaign and various anti-recall groups between 2000 and 2003, a favor Governor Davis returned by appointing Resnick to co-chair his agriculture-water transition team. But there is a gaping hole in most accounts of the jet-set Baby Boomer couple: their company, Roll International, is one of the largest, if not the largest, private water brokers in America. Through a series of subsidiary companies and organizations, Roll International is able to convert California's water from a public, shared resource into a private asset that can be sold on the market to the highest bidder. It all comes down to Stewart Resnick's involvement in the creation of a powerful but little-known entity called the Kern County Water Bank -- an underground water storage facility at the center of a plan to bring deregulation to California's most important public utility: water. According to a 2003 Public Citizen report titled " Water Heist," the Kern County Water Bank is an underground reservoir in the hottest, driest, southernmost edge of the Central Valley with a capacity of 1 million acre-feet, enough to convert the entire state of Rhode Island into a swampland one-foot deep or supply the City of Los Angeles with water for 1.7 years. The water bank was envisioned in the late '80s by the Department of Water Resources as a safeguard against prolonged drought. During wet years, it would serve as a repository for excess water coming in from Northern California and the Sierras, and pumped out in dry years. California spent nearly a hundred million dollars to develop the underground reservoir and connect it to the state's public canals and aqueducts, but in 1995, California's Department of Water Resources suddenly, and without any public debate, transferred it to a handful of corporate interests. All right, enough from Yasha for now. (It's a VERY long report, almost an e-book]. Now to a report from Open Secrets that from the date seems like ancient history as the crow of California's water crisis flies, but is actually very educational, and here again Resnick pops up. This story is the result of a collaboration between Southern California Public Radio and the Center for Responsive Politics. Last year, as California endured one of its driest years on record, the Westlands Water District made it rain 3,000 miles away — on Capitol Hill. The nation’s largest agricultural water district, located in the Central Valley, spent $600,000 on lobbying efforts, according to an analysis by KPCC in partnership with the nonpartisan Center for Responsive Politics. That’s by far Westlands’ biggest annual expenditure for lobbying — about six times what it spent in 2010. The lobbying comes as Congress and federal agencies consider how to respond to three years of drought conditions that have cut water supplies across the state and ratcheted up political pressure from the hard-hit agricultural sector, including many of Westlands’ customers. California farmers grow nearly half the nation’s fruits, vegetables and nuts. The California Farm Water Coalition, an industry group, estimates farmers — and the processors and truckers who get crops to market — could lose $5 billion this year due to the drought. How important is this issue? Well, in recent months it’s brought President Obama, the House Speaker and the powerful House Natural Resources Committee to the Central Valley. Congress is considering two major legislative packages — one already passed by the House, authored by freshman Republican Rep. David Valadao of Hanford; and one introduced in the Senate by California Democrats Dianne Feinstein, with Barbara Boxer as a co-sponsor. The bills have the common goal of redistributing water to meet farmers’ needs, but they differ on execution and the ramifications. The House bill, which was co-sponsored by the state’s entire GOP delegation, would rewrite water contracts and in the process set aside protections, which has environmental groups up in arms. The Senate bill would allow regulators to “provide the maximum quantity of water supplies possible” to where it’s most needed and boost existing federal drought programs by $200 million. California water politics is mostly about geography — Northern California’s watershed versus the Central Valley, which relies on that water coming south to irrigate crops, versus Southern California, with its massive and thirsty urban population. As the drought has worsened, those various interests have pushed harder for relief through campaign contributions to key members of Congress and by employing lobbyists. The two biggest spenders on water issues are Westlands, whose customers own 600,000 acres of farmland in Fresno and Kings counties, and the owners of Kern County-based Paramount Farms, the nation’s largest grower of pistachios and almonds. Just how serious is the quest for water? Last year, Westlands hired four different lobbying firms — even as the overall amount spent by all groups and corporations on federal lobbying has been going down since 2010. All eight of Westlands’ officially registered lobbyists previously worked in government — including a former Republican congressman from Minnesota. And the $600,000 Westlands spent in 2013 is only what was reported on required disclosure forms. According to an internal document obtained by Southern California Public Radio, Westlands also paid $90,000 last year to former California Democratic Rep. Tony Coelho for “Washington representation,” which was not included in Westlands’ lobbying reports. Coelho, who did not respond to requests for an interview, is related to one of Westlands’ board members and they are partners in a dairy farm. Westlands also paid another firm nearly $1 million for an “outreach and awareness” campaign. Money is extremely helpful in obtaining access and influence, which is crucial whenever Congress gets involved. That’s true whether the cash is in the form of spending on lobbying or campaign donations. 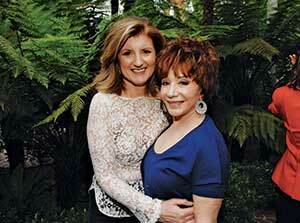 Paramount Farms is owned by Lynda and Stewart Resnick of Los Angeles. Their multi-billion dollar fortune comes from a diverse portfolio that includes Fiji bottled water. They have a controlling interest in the Kern Water Bank Authority, which stores underground supplies of water to irrigate Paramount’s nut trees. The bill that passed in the House would mandate an increase in pumping from the Sacramento Delta. Doug Obegi, an attorney with the Natural Resources Defense Council, says that water would primarily go to Central Valley Project contractors, including the biggest — the Westlands Water District. The bill also extends for 40 years all existing federal water service contracts — including the one for Westlands. Lawrence says that takes away any flexibility to make water decisions for a generation. He notes that once you’ve delivered a “signed, sealed contract, let alone been directed to do it by the Congress,” you’ve taken away any chance at reviewing how future water should be allocated. Feinstein’s Senate bill includes several provisions that would allow Delta water to be sent farther south to Kern County. Patricia Schifferle of the environmental group Pacific Advocates says, because of previous legislative amendments, the water would be made available to the groundwater bank controlled by Feinstein’s supporters — the Resnicks. Feinstein recently revised her bill. This latest version includes a provision to boost Colorado River storage in Nevada, home to Senate Majority Leader Harry Reid. This version could make it to the Senate floor for a vote without going through the committee process. The lobbying isn’t limited to Capitol Hill. It also takes place at the agency level. John Lawrence says private meetings are held behind closed doors at places such as the Bureau of Reclamation or the Environmental Protection Agency, where there’s “greater wiggle room” on how water policies are implemented. Those conversations are confidential, not debated openly in Congressional committee hearings. Westlands’ reports show it lobbied the EPA, the Agriculture Department, the Interior Department (which includes the Bureau of Reclamation) and the Council on Environmental Quality, in addition to Congress and the White House. Three of the water district’s lobbyists are former high-ranking officials of the Interior Department. There’s even a place lobbyists and campaign contributions collide: Schifferle from Pacific Advocates notes a 2012 breakfast fundraiser for Feinstein in the offices of one of Westlands’ lobbying firms, held “right around the time” of a budget amendment that gave water agencies access to federal water. In Washington, certain wells never run dry. This is quite literally a whine and cheese plan by someone who may be smoking dope. To solve California's problems, carve the state into marijuana (North California), wine (Napa Valley), cheese (Central Valley dairy) regions, and some other stuff. Democrats hate the idea, of course, but I'm with them on this one. The plan's mastermind is one Tim Draper, a "venture capitalist." His six state initiative has collected enough signatures, 800,000+, to get on the Nov. 2016 ballot. What I find disturbing is that a snap survey turned up only 59 percent of Californians who are against the plan. This, according to the USA TODAY report on the plan, which includes a map of the proposed states. Looking at his map I get the feeling that Tim Draper doesn't want six states, he wants one country: Silicon Valley. But he knows that would never get on the ballot. A state is not a company; its problems aren't troublesome divisions that corporate can peel off. Move to Singapore, Mr Draper, if you like the idea of a small nation-state. Get out of my country. A stunning technological achievement but with very bad news to report. Yet GRACE could give humanity the edge it needs, on the theory that there would have been no chance without governments here and around the world, from the federal to municipal levels, knowing exactly where they stand in terms of their groundwater supplies. See the National Geographic website for the many links in the article below, including link to the NASA GRACE Mission website. A note regarding the author's mention in passing of Nevada's vast Lake Mead: On July 10 the Associated Press reported that the water level in the lake had dropped to an all-time low; the lake is now at 39 percent of its capacity. (Its 'sister' reservoir farther up the Colorado River, Lake Powell, is at 52 percent capacity.) Officials had projected the decline at Lake Mead and don't expect there will be cuts to water deliveries to Nevada and Arizona this year or next, but they give a 50-50 chance there will be cuts in 2016 (depending on drought conditions). Las Vegas, a city of 2 million residents, is almost completely dependent on Lake Mead for its drinking water. Yesterday our team at the UC Center for Hydrologic Modeling released a report on the California drought. The report describes the bird's eye view of statewide water resources that we see from the NASA GRACE satellite mission. We’ve been working since the mid-1990’s, well before the mission was launched in 2002, to develop and test methods to help monitor groundwater depletion from space. We’ve applied them around the world — in California, across the U.S., in the Middle East, East Africa, in the Amazon River Basin and in India.Our endgame is simple. We want to use GRACE and other satellites, combined with invaluable measurements on the ground, to help quantify how regional and global freshwater availability is changing. The good news is that the methods work great. The GRACE mission functions like a giant ‘scale in the sky,’ weighing how various regions around the world are gaining and losing water each month. We can see the ups and downs of ‘total’ water storage – all of the snow, surface water, soil moisture, and groundwater – like never before. The bad news is that we are running out of groundwater. In particular, this is happening in the places that we need it most — the dry parts of the planet where we love to live, precisely because it does not rain. Out of necessity, our reliance on groundwater in these parts of the world is much greater than elsewhere. Our team and several others around the globe are showing that most of the major aquifers in the world’s arid and semi-arid regions are being depleted at a rapid pace, and one that is most likely unsustainable in the long term. Groundwater is a finite resource after all. What has GRACE shown us about California? Our earlier study showed that between October 2003 and March 2010, the Sacramento and San Joaquin River Basins lost about 30 cubic kilometers of freshwater, nearly the equivalent of the full volume of Lake Mead. Of this, we determined that about two-thirds was due to groundwater depletion in the Central Valley. During the drought of 2006-2010, state and federal surface water allocations were drastically reduced, forcing farmers to tap groundwater reserves far more heavily than in ‘normal,’ wetter years. The resulting volume of depleted groundwater was so great that it was registered by a satellite ‘scale’ that orbits about 400 km above Earth’s surface. Our new report is an update to this previous work, and it points to one critical question for California. One of the key numbers to emerge from the report is that the combined Sacramento and San Joaquin River Basins have already lost 10 cubic kilometers of freshwater each year in 2012 and 2013. To put that number in perspective, it is roughly the amount of water used by the entire population of California, for household, municipal, and industrial use (that is, for nearly everything else besides agriculture and environment). It is also the steepest decline in total water availability that our team has witnessed in the 12 years that we have been monitoring California water resources with the GRACE mission. A second contribution of the report is that it further exposes the unsustainable pattern of groundwater use in the Central Valley. While there is some replenishment of groundwater during wet years, groundwater levels decline precipitously during drought, when farmers have no choice but to rely far more heavily on groundwater to meet their irrigation water needs. All right. There's much more to the report, and again, numerous links to papers, satellite data, the GRACE mission, etc., but I think the above is enough to convey the picture. More than 80 percent of California's water use goes to agriculture, and much of that is in the two valleys that make up the Central Valley -- San Joaquin and Sacramento. Triage efforts will have to focus there first, but this running smack dab into the state's hydropolitics, which is almost cosmic in complexity. .
One example comes from southern Idaho, where grower Timm Adams has worked with [Anheuser-Busch beer company] to shift his barley production to the winter season. Because the crop can use the natural moisture from the rain and snow that falls during that time frame -- it requires 20 percent less water while producing a greater yield than other strains -- his operation can decrease its purchases from the local irrigation district, Adams said. Overall, the load on the local estuary is also decreased. Wow. It's almost unimaginable how much water could be saved if all grain farmers took up the same method wherever possible. The world's biggest beer brewer, Anheuser-Busch InBev has adopted an aggressive series of five-year environmental goals, calling for further reductions in water and energy consumption and setting its first formal targets for packaging reductions and eco-friendly coolers. The seven new commitments come just four months after AB InBev revealed it had surpassed previous three-year commitments for water, energy and waste. The Belgian-based brewer already has saved enough water to produce about 25 billion cans of AB InBev beverages. Currently, it uses an average of 3.5 hectoliters of water for every hectoliter of production. Now it is trying to squeeze more from the process: The new five-year goal aims to reach a global average of 3.2 hectoliters of water per hectoliter of production. For those who like to visualize this sort of thing, that works out to the amount of water it would take to fill approximately 5,400 Olympic swimming pools. The Carterville brewery in Georgia already has outstripped that goal: It uses just 2.8 hectoliters of water per hectoliter of production. To move toward that measure in other production facilities, the company is introducing water management measures in each of its key barley growing regions through partnerships with local stakeholders and growers. In addition, it is introducing watershed protection measures at all of its facilities in Argentina, Bolivia, Brazil, China, Mexico, Peru and the United States. The new commitments are notable for their global scope and because they also focus far more attention on encouraging sustainable operations throughout AB InBev's entire supply chain, according to AB InBev executives. "Our approach recognizes that there isn't a one-size-fits-all solution to improve sustainability," said AB InBev CEO Carlos Brito. "The key will be to leverage the experience and expertise of our colleagues globally, foster a collective approach through partnerships with local stakeholders and continue to scale best practices across our company." Yuppers, beer has saved the world before, and just might do it again. "The theme here is that stewardship starts with measurement." As many exciting solutions as the speakers identified, they kept coming back to the reality that businesses need to get much more serious about assessing their own water performance and risks. The scarcity of data -- both on the risk side and top-line -- remains a huge obstacle; many stakeholders are reluctant to publicly release data and there is a lack of standardized data collection. Ultimately, the reality of water scarcity and climbing demand will leave no choice for stakeholders who are reluctant to part with data sets. Advances in technology such water-smart meters may provide a promising path to better and easier data collection, lowering the cost and hassle factor for water users, including farmers. The theme here is that stewardship starts with measurement: if they haven't already, businesses need to start assessing their water performance, set a baseline and work towards reducing use. For commercial and institutional water users, tools such as the Water Efficiency Toolkit that EDF developed with AT&T can offer a first step toward assessing water performance and mapping out actions they can take to improve it. See the report for links to information on the toolkit and advances in technology. The Associated Press and Reuters reports I quoted in an earlier post make clear that California's government has the same problem as the private sector when it comes to getting accurate data on water usage. The situation exists across the board; few if any governments at the local and national levels in the USA and around the world know with any accuracy the amount of water used in their jurisdictions and how it's used. The upshot: Many big surprises about how quickly and where water supplies are running out. So while it's good to talk about shared responsibility, stewardship, and great new technologies, intelligent prioritizing about where to place resources for dealing with water scarcity depends on accurate, comprehensive data collection. If there's one thing that can cut through the Gordian Knot of water crises in the United States and worldwide, it's that. The strategy is twice smart because the water crisis is rushing toward us faster than most supposed 15 years ago. (1) Coca-Cola, despite the fact that it bottles its beverages in countries with big water issues, didn't even have a water scarcity strategy, and it's already paying for that. (See the GreenBiz report below.) As early as 2000 far-sighted folks at Ford did realize the importance of developing such a strategy for their globalized plant operations, and the strategy is now right on time, as region after region around the world falls prey to severe water scarcity. The inspiring part is that when Ford executives saw the crisis on the horizon, they embraced the challenges of dealing with it with gusto. Bravo, Ford! Yet Ford's strategy can be applied to water crises here in the USA. I was struck by this remark from a Ford executive: "The first part of anything is getting the usage measurement and then relating it to something." For many companies, the cost of water — compared to the overall cost of production — hardly makes a blip on the radar screen. Yet clean water, or lack thereof, can cause a whole factory to suddenly have to shut down or, even worse, lead to a company losing its social license. In mid-June, Coca-Cola had to learn that the hard way when one of its bottling plants in India got shut down by the authorities because it was extracting too much groundwater. “But what happens if you don't have water?” Sarni asked. “What does it mean if you don't have water for a week and you cannot make automobiles?” Sudden regulatory changes can be equally as challenging for companies. As a result, some are starting to recognize water supply as a fundamental business risk that has to be part of a growth strategy. “How does water – no pun intended – fuel that growth strategy? That is really the right way to think about it,” said Sarni, who urged managers to get in front of the issue as opposed to being defensive about it. Ford Motor Company is one example of an entity that has recognized the risk early on and took on the challenge. According to Fleming, Ford reduced its global water use by 61 percent, which equals more than 10 billion gallons. Its most recent sustainability report also reveals that Ford reached its target for water use per produced vehicle two years early. Instead of reducing it by 30 percent until 2015 (2009 being the baseline), the target was achieved last year. The new target set this year is going to be minus 2 percent per vehicle produced compared to 2013. To illustrate how it can be done, Fleming used the example of the Ford factory in Cuautitlán, Mexico. It was built in 1964 in a region where water was already scarce. Since then, many other international corporations established factories there too. Today the underground water table is dropping by 3 to 4 meters per year, according to Fleming, and water has to be pumped in from other regions. Since the 1990s there have been limits on water withdrawal. Replacing asphalt with ecological concrete, which allows rain to reenter the ground. The ecological concrete is a good example for implementing a win-win technology. By letting rain water pass, it recharges 9.700 square meters, allowing 7.5 million liters to penetrate the ground. At the same time, the concrete is less expensive and easier to maintain, which saves Ford $40,000 in maintenance per year. But Fleming stresses that the problem is too big to be tackled just by one company. As a result, Ford collaborates with other organizations, both public and private. "What we're doing really illustrates how water is now becoming more and more a business issue within other industry sectors,” said Sarni, and cited oil and gas, power and utilities, heavy manufacturing and semiconductor manufacturing. In his view, thinking about water should not just be a management issue, but should result in thinking about stewardship. One of the big challenges is how to implement the right strategy given that at the moment the price for water does not reflects its real value. “We are addressing water not from a pure price standpoint but as a scarce resource,” said John Viera, Ford's global director of sustainability & vehicle environmental matters in the webcast. And things are progressing fast. Matthias B. Krause is a Berkeley, Calif.-based journalist covering energy, technology, business and the environment. Previously he served as executive editor for the solar power magazine PHOTON USA. His work also has appeared in a wide variety of publications in the U.S. and in Germany such as Green Tech Media, Vanity Fair Germany and Frankfurter Allgemeine Zeitung. A big thanks to Matthias Krause and GreenBiz for their informative reporting on the company's strategy. Forget superbugs, an elevated terror threat and civil wars in MENA. This is serious. The good news is that MillerCoors beer company has sprung into executive action, as has Campbell Soup Company. No no Campbell doesn't make beer but it's dawned on them that a world without enough water to make beer also means a world without Campbell soups. So those two for-profit concerns and other companies have pitched in to teach (or is it flog?) California farmers to adopt best practices when it comes to water conservation. This, while the state's politicians are still stumbling around in the face of apocalypse. The Pacific Institute's water director, Heather Cooley, emphasized the limits of old thinking, and the importance of rethinking demand, supply and management of water. Instead, we need to reduce waste and increase efficiency, rethink economic priorities and choices in both urban and agriculture uses, treat and reuse wastewater, capture storm water, and improve data collection and monitoring. Another theme that surfaced throughout the day is the importance of partnerships to achieve lasting results. Operating a brewery in the Irwindale section of Los Angeles, MillerCoors is constantly reminded how its capability to operate is tied to the city's water resources, said Kim Marotta, director of sustainability. Water risk is a material issue for the company; no water means no beer. To create change, companies like MillerCoors have to share the responsibility alongside communities. If Marotta's talk was any indication, they are taking action. Partnerships with farmers have dramatically cut water use, runoff and energy use through innovations such as planting tall native vegetation, retrofitting irrigation systems and implementing best practices for water management. Through these and other measures, MillerCoors was able to reduce water use by 1.1 billion gallons as a company, equivalent to the annual needs of 11 million people. As a result, the food company has identified numerous opportunities to improve performance, through testing different irrigation scheduling practices and sharing data and best practices with Campbell's growers. The next Pundita post, which features another report from GreenBiz, has more good news. A great many people are suddenly awake about the serious threat from water scarity and putting on their thinking caps. I mean -- beer! It doesn't get more serious. Even two years ago scientists working on drought related issues couldn't pay people to read their research; now rarely a week goes by without a study being published and snapped up by government agencies, journalists, columnists, and bloggers. Drought is a hot topic. Problem: several environmental activists focused on "man-made" global warming have seized on the growing mountain of drought data to promote their agendas, which can distort reporting on the research. And their opponents in political, government, and business spheres have added to the confusion with their own interpretations of the data. Then there is the United Nations Dialing for Donations crowd, and the international nonprofit agencies that follow UN projects in the way seagulls follow an ocean liner. These creative thinkers can actually translate data on anything, even the mating habits of the spotted nematode, into a plea for money. All this makes it very hard to sort through an already complicated issue, one that has many parts. Below are reports I've found helpful as I try to fit together a jigsaw puzzle that isn't accompanied by a picture on the box top. 1. (This is the report that mentions the New Mexico AG's remark that Texans are water rustlers.) Times Record News; February 5, 2013; Texas Wrangles With 2 States Over Water: "Other states are keeping wary eyes on the upcoming Supreme Court decision because the Red River Wars of the 21st century could have a huge impact on the many other water compacts across the nation." The Supreme Court ruled on June 13 and sided with Oklahoma. Numerous reports and opinion on the Net about the far-reaching decision; here's one from State Impact NPR that really drills down. One of the many points made in the report relates to the population increases in Texas, so it's not only more farming that's taking a big toll on the state's water supplies. [...]The AP has found that around 4,000 California entities—many of them companies, farms, or water districts—have not been affected by [water restrictions] at all as they continue to have access to an"unmonitored amount of free water", thanks to water laws dating back to the Nineteenth Century that are still in place. 3. June 9; Reuters reports political infighting in California about approaches to dealing with drought there. 4. The above report is a perfect companion piece to the April 25 Reuters one, In California drought, big money, many actors, little oversight, which I featured in the previous post. One caveat: The predictions quoted in the June 11 report about whether EN would occur this year have already been superseded. When last I checked it's now about 60 percent certain EN will occur but it could be a weak system, although that projection can change on a dime. The report quotes an expert as saying that even a "godzilla" El Niño this year can't, on its own, rescue California from its drought -- although a godzilla would help. If it's only a small or moderate EN, then no help at all. We'll find out in a couple months what fates the weather pattern visits on the USA. Lots more on the internet about this issue. They're now doing so much pumping of groundwater that one water driller told NPR the other day that the valley was on track to run out of groundwater. I guess that would solve the problem of the land sinking more. 7. Can California Conserve Its Way Through Drought? I'm afraid the following National Geographic report and the study its based on don't take into account the simple fact brought out in the Reuters (4/25) and AP reports quoted above: it's really hard to talk about a target water conservation number and put a number on the water deficit when no one has an accurate figure on water usage in California! With worsening shortages, the Golden State turns to water conservation. Will it work? [...]This year, the state is expected to have a water deficit in excess of six million acre-feet, enough water for 1.5 million typical households, according to a report released this week by the Natural Resources Defense Council and the Pacific Institute on the need for more conservation. To fill that shortage, water agencies are turning to sources, such as groundwater, that are not easily replenished and may decrease the available supply in the future. Such improvements have an upfront cost, roughly $2,000 an acre for drip systems, but Poole says farmers who have already switched are seeing short paybacks of a few years. Not only do they use less water, which saves them money on their substantial (and rising) utility bills, but many find their yields improve with more efficient watering, she says. If cities boosted their efficiency and reuse of water, they could readily save 5.2 to 7.1 million acre-feet of water per year, the report says, or more than enough water to supply all of urban southern California. Earlier this year the state allocated nearly $700 million toward those kinds of investments, and some projects are already under way around the state. "Cash for grass" programs, in which residents are paid to replace their lawns with water-free plantings, have been particularly popular, says Poole. On June 3, the State Water Resources Control Board issued revised rules that make it easier to use recycled water for landscaping. Poole says there is much work to be done, including ramping up investments in traditional water infrastructure and improving water-use data collection. But, she says, "with more concerted effort and policy support, we can easily get to that 20 percent savings and beyond." 8. A ray of hope. Despite the grim title of the Guardian report, a study just published in June holds out hope that it's now possible to pinpoint the role that human activity plays in climate change. If the approach pans out this will settle many costly and time-wasting arguments, and make better use of charitable and taxpayer funded resources for dealing with climate-related crises. We all know that some climate change is natural, in fact, even without humans, the Earth’s climate changes. But, as we have added heat-trapping gases to the atmosphere, we have seen human influence “emerge” from natural variability. Droughts, one of the most intensely studied climate events, are a perfect example of an effect with both human and natural influences. Separating the relative strengths of the influences is a challenge for scientists. But, when we deal with drought, with its large social and economic costs, it is a challenge we must undertake. A very recent study tries to do just this. Published in the Journal of Climate, authors Richard Seager and Martin Hoerling cleverly used climate models forced by sea surface temperatures to separate how much of the past century’s North American droughts have been caused by ocean temperatures, natural variability, and humans. Water Crisis Gordian Knot, Part 1: "Nobody pays any attention to these districts. So nobody knows what is going on"
It turned out I'd collected more reports on the water crisis than I'd remembered during my conversation with Mike (see the previous post), so I decided to give the links to the water issue their own post instead of lumping them with reports on land grabs and villagization. Then I recalled that the following Reuters report goes a long way toward answering the question that has risen to the top for those outside the state when they look at California's water crisis: Why can't those people get it together? It's not the only answer -- the crisis is made up of many situations tangled together -- but unless the situation detailed in the report is dealt with, it's going to be hard to make meaningful progress at resolving the crisis. So, below is the entire report. At the bottom of the story is not so much corruption and negligence but a way of life that lurched along for decades because it could. In Part 2 of this post I'll try to stuff in all the links to the other reports I collected, to which I've added some quotes from the reports and a few comments of my own. While some of the reports have probably been seen earlier by those readers already following the crisis, the links provide a picture of the pattern I'm looking at when I study the situation. (Reuters) - In the middle of one of the worst droughts in California's history, no one knows exactly how many agencies supply the state with water. Californians had operating expenses of $7.3 billion for fiscal year ending 2012. Their long-term bond debt amounted to $20 billion, according to the controller's office.